A gigantic monument at the bottom of the Sea of Galilee, as well as several mysterious structures, including a gigantic stone wheel and a moon-shaped monument, were recently found in northern Israel. The mysterious structures have left archaeologists around the world bewildered. Who built them and what were they used for? They may be some of Israel’s most mysterious structures. They are easy to miss from the roadside but can clearly be seen from the skies or beneath the sea. The prehistoric stone monuments of Gilgal Refaim, Jethro Cairn and the circular structure found in the sea of the Galilee went unnoticed for centuries in the disputed regions of the Golan and the Galilee but still archaeologists don't know who built them, or why. Theories have gone wild and include ancient calendars, ceremonial structures, or 'sky burial' sites in which dead bodies were placed on top of stone mounds to be picked apart by vultures. Even more eluding is that that are no archeological evidence of a city near them, and some have therefore posited that the structures is in fact a huge monument carrying symbolic significance. The possible age of the structures is even more enigmatic and many put the estimate anywhere between 3,000 and 12,000 years old, making them older than the pyramid of Giza and Stonehenge in Great Britain. The only thing we can say with certainty is that they are there and they are huge. In 2014 Israeli archaeologist reported of a crescent shaped stone monument larger than a football field in northern Israel. At about 150 meters in length and 7 meters in height, the monument, dubbed ‘Jethro Cairn,’ can be seen on satellite images. Bronze Age pottery excavated at the monument indicates it was built between 3050 and 2650 BCE, but it may be much older. The monument’s shape, a crescent, may have been chosen to symbolize the ancient Mesopotamian moon god Sin. The Moon-god Sin or Naama was the special guardian deity of the Chaldeans who lived in the ancient city of Ur. Once a center of worship of the moon-god, the site’s most prominent feature is still a temple tower, or ziggurat, some 61 m long, 46 m wide, and 21 m high. Only a day's walk from the monument sits late bronze age city called Bet Yerah, meaning "house of the moon god" in Hebrew. Another 13 kilometers southeast of the monument another enigmatic monument was discovered, this time below the sea level. Not far from where the monumental crescent was found, another enigmatic structure has eluded archaeologists ever since its discovery was announced in 2013. 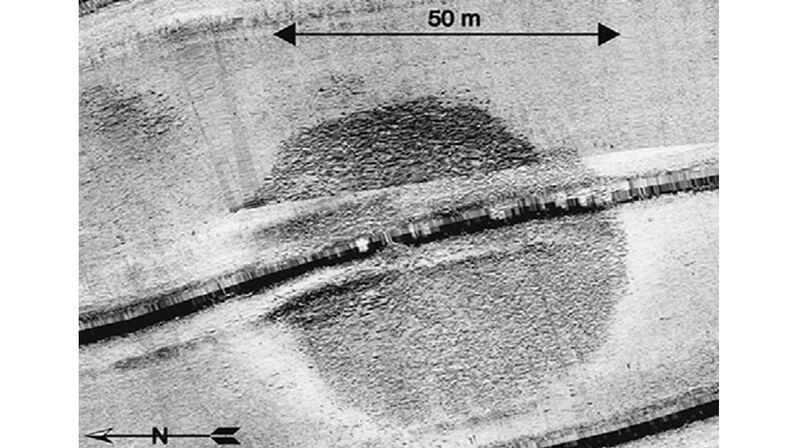 The mysterious structure with a diameter greater than the length of a Boeing 747, was discovered by divers about 9 meters underneath the Sea of Galilee in 2003. The massive structure was built out of basalt rocks, arranged in the shape of a cone. It measures 70 meters at the base of the structure, is 10 meters tall, and weighs an estimated 60,000 tons. It is twice the size of the ancient stone circle at Stonehenge in England. The archeologists think it was built on dry land and later submerged by the lake but the exact age of the structure has been difficult to pinpoint. However, one thing the archeologists are certain of is that the monument was likely of great importance to the people who built it. The nearest basalt outcrop was a few hundred meters from the site, and the stones, which were one to two meters in width, would have weighed over 90 kilograms at times. The prehistoric monument known as Gilgal Refaim was another Herculean task to build. Its Hebrew name of Gilgal Refaim means 'wheel of giants' and refers to an ancient race of giants, the nephilim, a superhuman race mentioned in the Bible. The gigantic monument deserves its name since it is made up of more than 42,000 basalt rocks arranged in five concentric circles that together weigh over 40,000 tons. The complex has a 4.5 metre burial chamber at the centre of five circles, the largest of which measures more than 152 metres wide. Standing on the ground inside the complex, it looks like a labyrinth of crumbling stone walls. Only from the air does the impressive shape of a massive bull's-eye clearly emerge. Some of the circles are complete and others are not, suggesting it may have been laid out in accordance with astronomical patterns. On the shortest and longest days of the year - the June and December solstices - the sunrise lines up with openings in the rocks. It looks like a computer in stone – to forecast solar and lunar eclipses. But how could men wearing skins transported these massive stones and erect computers in stone? The possible purpose for these structures remains an enigma but the monuments were evidently of great importance to the people who built them. Our science has rediscovered and perfected old ideas, it has demonstrated the prehistoric world was more ancient and advanced then we ever could imagine just a few generations ago. However, one of the greatest handicaps archaeologist and historians are confronted with is the lack of evidence. If it were not for burning libraries in antiquity, mankind’s history would not have so many missing pages. Science emerged fro the dark middle ages during the Renaissance by studying ancient sources and knowledge that had been known by the Babylonians, Egyptians, Hindus and Greeks for many centuries. Having that said, it is difficult to account for the ancients having unexpected knowledge of the two moons of Mars and how could Hou Yih of China know that the moon was desolate, cold and glassy forty-three centuries ago? How come Greek philosophers were aware of the vast distant between stars and why were ancient thinkers aware of planets beyond Saturn which could not be seen without a telescope? Myths about the descent of skybeings are global and the Epic of Etana, the Book of the Dead and the Book of Enoch all drew pictures of extraterrestrial space. Since about 8000 BCE man transformed his personality of a roving hunter for that of an established farmer and city tradesman year ago. When man began to cultivate crops, domestic animals and perfect his tools and weapons, he stepped over the threshold of civilization. That took place some 7,000 years ago. Did the ancients receive a scientific legacy from the survivors of an older civilization? It's unique to transport these stones and unique to arrange them. You need to plan and to mobilize people, because they're too heavy to be carried by a single person. Not to mention that that people were obligated most of the year to agriculture. Only an advanced prehistoric society capable of organizing the construction of such large structures could have accomplished this monumental works but who they were remains one of the greatest mysteries of our days. What is certain is that these people were building something that was more durable than their brush huts. What inspired and motivated such significant tasks efforts for a people who had to devote most of their time to cultivating crops? Perhaps the source of civilization lies farther back in time. All the great civilizations of the past speak of a long lost Golden Age. There were the Golden Age of Peru, Mexico, India, Egypt, Babylon, China and Greece. Perhaps instead of asking why and what these monumental monuments were used for, we should ask who were the torch-beares of civilization that, at the dawn of history, imparted their knowledge to the astronomer-priests all over the globe. There was a golden age in which the miracles of science were as commonplace as they are now. The source of this forgotten science must be sought in Time as well as in Space. Sam Bostrom is an Ancient Historian and Writer. Please keep A.O. members posted on any new developments. It is also my belief the true Golden Age of humanity goes much further back than current evidence suggests. May your path be filled with light.